What's New in LayMan version 3.00. LayMan version 3.00 is a major release. It is now a Microsoft .NET client application and an OLE client of MapInfo Professional. It is designed to facilitate navigation between windows and enhance the traditional window, table, map, layout and workspace functions within MapInfo. 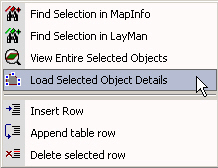 Attached to an edge of your MapInfo work area, LayMan responds dynamically to your normal MapInfo window interaction. There have been major improvements to the user interface and the functions since the previous version. LayMan version 3 supports MapInfo Professional versions 5.5 to 8.5. It will most likely run without problems on earlier versions back to version 4.0 (the first version supporting Integrated Mapping – or OLE automation). Supported Windows platforms are all .NET supported platforms (xp/2k/nt/me/98). MapX is not supported in version 3. The previous versions support MapX. LayMan is licensed per CPU for US$49. LayMan’s functions are free use but with occassional registration reminder. Support LayMan development by purchase and registration. Delete Selected Poly Node(s) is now available on the Object Grid for polylines or regions. Use this in conjunction with row selection to delete nodes. Use this as a data grid-based alternative to MapInfo node editing and deletion. A bug was introduced to the Table Catalogue Filter in version 3.10. This may have caused a number of filter operations to fail including Show only Tables Intersecting Map. The Line Direction layer grid attribute cell was disabled for line layers. Fixed. It is now disabled for symbol and region layers. Layer Grouping has been enhanced to save assigned groups in the table catalog rather than in the LayMan.prf preferences file. This allows grouping to be defined by table path rather than by map. When a map layer grid is loaded, the groups are automatically assigned by reference to the table catalog. See the Info button documentation for usage details. All data grids (workspace, layer, table, table metadata, table object, symbol catalog)can now be printed. Right click for the context menu and preview or print. Columns are adjusted proportionally to fit the page width. Collapsed columns and rows are not printed. All rows are printed (selection is ignored). To print the contents of a catalog, load the associated table (lmTableClass, lmWorClass, lmAppClass) and print. (Alternatively print from a Browser). Workspace search provides the facility to search all or selected workspaces in the catalog for a nominated string. The matching line is displayed and a summary of all workspaces presented at the end of the search. Layer icons would sometimes load incorrectly. Fixed. The layer grid user function as a MapBasic script or program was not functioning correctly. Fixed. (3.07) Some layout objects in the navigation pane were unnamed. Fixed. Double click on Label Properties in the Layer Grid, would result in window focus problems, requiring a restart of LayMan. Fixed. A Label Style click on the Layer Grid resulted in the font icon displaying in the Object Style column, rather than under Label Style. Check box clicks in the data grid have been changed to a more intuitive 2-way setting rather than the previous 4-way for multiple selected rows. Arrange windows always – LayMan monitors new MapInfo window locations and shifts them to ensure they are not covered by the LM window. Auto start – LayMan will start automatically when MapInfo starts. Close temp tables on MapInfo exit – LayMan closes any temporary tables or tables located in the temporary directory. Use this to ensure mapinfow.wor does not include temp tables on restart. Layout and paper units > … - Sets the units for use with layout position editing. Must match the units assigned to the layout. A problem with the LayMan window disappearing on the first click after starting (and reappearing on the second click) has been corrected. The wrong workspaces mmay have been run when multiple workspace catalog nodes were selected and run in safe mode. Fixed. In safe or step execute mode, workspace lines with more than 254 characters were truncated. This has been corrected by splitting the long line at the appropriate delimiter character for loading into the data grid. During safe or step execute mode, continuation lines in workspaces were shown graphically by a blank icon. It is now “… ”. LayMan has been tested with MapInfo Professional v8.5. The font “MapInfo Dispersed Groups” is loaded into the Symbol Catalog if v8.5 is the current version. (If you are an existing LayMan user, delete the table lm_Install_Dir\lmSymClass to force this load). 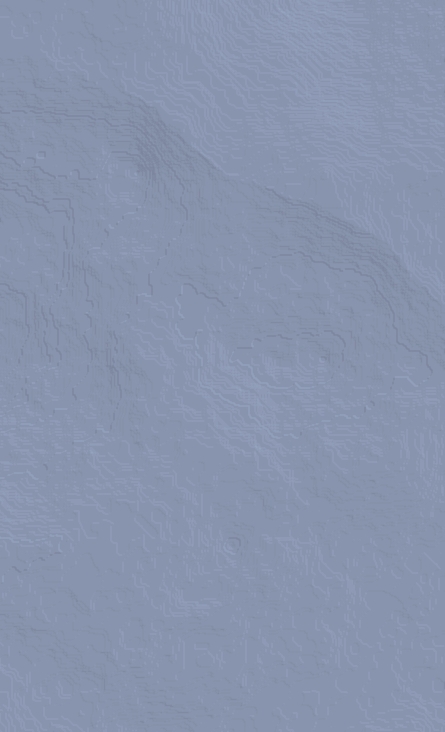 Layer grid groups were not restored correctly when the same map was reloaded. Layer attribute changes with a group collapsed were not correctly set on each layer within the group. Note that any attribute changes to a group in collapsed mode will be made to all contained layers even though the particular setting may not have been identical in all contained layers. When a group is double clicked to collapse, the master (displayed) layer was not left selected. This has been fixed. Layer grid operations (insert, remove, optimal order) were not supporting collapsed or expanded layer groups. Fixed. Documentation on layer grouping has been added to the LayMan Info window. An object grid is now available for display and edit of polyline and region objects. Right click a table row to load the object grid. Click the table icon in the Info window for help on the new feature. This is a useful alternative to an Edit > Reshape in MapInfo Pro, as it allows browsing by object part (section/polygon) and node and editing by coordinate value. Table editing now supports multiple selected row update from a single altered cell. This is now consistent with layer grid editing. A window sizing problem which could reduce the LM window to dot size has been fixed. The minimised window size is now the smallest window. Performance of the tree view load, select (esp. shift-select) and action has been improved. This is most noticeable with a large number of tables open. Acceptable performance with 1000 or more open tables should be expected (working with this number of open tables in MapInfo Professional is not desirable). Tree view panel flashing during multiple load corrected. Open and map selected items in the tree view stopped with a table error. Operation now skips the problem table and continues. During open table list and table catalog open and map, the LayMan progress bar is enabled. Changes to unregistered operation. All functions available but with occassional registration reminder. The registration dialogue has been updated to the Spatial Projects standard, including check for updates support and transfer registration to another PC. The table catalogue loads significantly faster than the previous version (40 secs for 6000 items). Show selected table bounds has been added to the tables, layers, table catalog item menus. This will add the MBR of chosen tables to the front map if they intersect or a new map if they don’t. Table catalog filter provides the ability to quickly filter the catalog to a subset of types shown on the menu. The types include base, seamless, unmappable, image, link, query, view, WFS, WMS. Also filtered by object type: symbol, line, polygon, text, mixed. The filter also has a Show only tables intersecting map option. Map selected tables now checks the current map to see if the table bounds intersect. In this case, the table is added to the existing map. Any chosen tables that do not are added to a new mapper. Info and registration dialogue button clicks now minimizes the LayMan window. The window is restored when the dialogues are closed. Optimal Layer Order improvements in the ordering of image layers. Images are place on top of solid fill contiguous region layers and underneath transparent region layers. A number of corrections and enhancements to workspace safe mode and step execute. Approximate table name matches now provided against the catalog. (3.03) Patched to run with MapInfo Pro version 5.00. Minor improvements to “Handshaking Off” mode. Buttons have been upgraded to a buttonpad style. A minimize and restore button allows LayMan to switch between a minimum size showing just the buttonpad and the user-specified window size. MapInfo handshaking “Off” mode has been improved to reduce the amount of interaction with Mapinfo while still responding to window state changes. Previously, workspace catalog, Show by Workspace Path was not sorting the list. In the layer grid, the label override style was displaying in the feature override style column. The symbol catalog did not support symbol changes in the cosmetic layer. User functions in the layer grid were sometimes not saved and were not copied to multiple selected rows properly. View entire layer on raster layers now functions correctly. Seamless layers were dropping from mappers on window focus change or on selecting objects in the map window. This was apparently due to a MapInfo bug in that “a query table close for a query derived from a seamless layer causes the layer to be dropped from any mappers”. Query table operations on seamless tables in LM have been restricted. Remove layer function wasn’t updating the layer grid. Workspace catalog display is refreshed after a build. 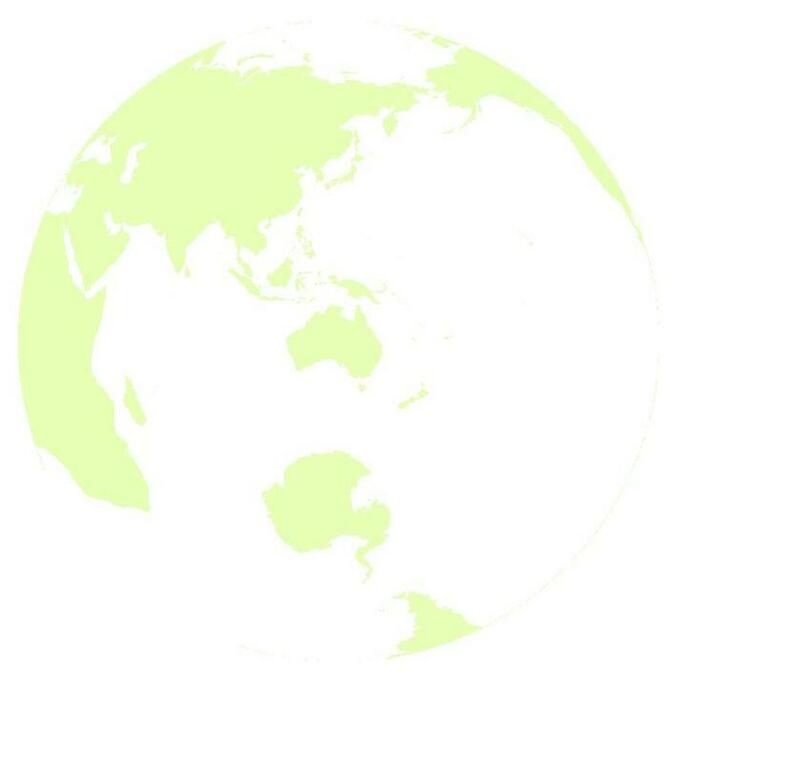 Optimal layer order wasn’t supporting image layers correctly. Navigation tree <-> data grid select response improved for layouts and layers. Refresh LayMan button may have caused LM to remain behind MI. Mapper object select with the layer grid displayed was scrolling the navigation node in to view but not the layer grid row. Similarly, navigation layer node selection wasn’t scrolling the layer grid into view. Fixed. Catalog build progress displays in the LM data grid panel. Table catalog provides the ability to open and map any registered table on your network. Filter the list by table type and intersecting current map window. Workspace catalog shows registered workspaces on the network. Edit or run from the list. Application catalog has registered applications. Run from the list. Dock with any edge of the MapInfo workarea. 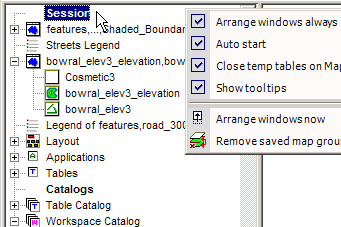 Adjust panel widths to suit and make adjustments to layer properties with immediate changes in MapInfo. Your previous dock status will be restored on subsequent sessions. While editing map objects, the data grid is best displayed at the top or bottom of the MapInfo window. Bring selected MapInfo windows to the front and then select frames within a layout or layers within a Mapper. Browse the table, workspace, application catalogs. 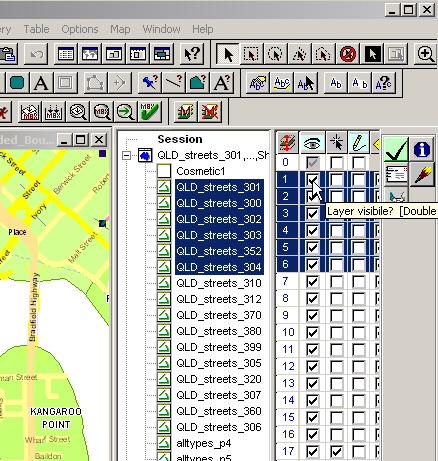 During a MapInfo operation, or at a MapBasic application statement that pauses operation, LayMan navigation panel may be used to bring windows to the front or browse for names. Click "Ignore MapInfo" if you are about to run intensive window or object select /edit functions. This will remove a small CPU load from your processing and avoid unnecessary updates in LM. LM Responds to single feature selections when a table or layer grid is displayed; window focus changes; windows contents changes in Map window. Reduce the visible layer clutter in the list. Can be expanded and collapsed with a double click on any grouped layer name. May be set globally for all users in an office network by building the table catalog once for networked tables, assigning the groups and then distributing the catalog table (lmTableClass) to all users. Users may then update the catalog with local tables if appropriate. Select the layers to be grouped. Click on the first selected layer group cell and type the group name (allRds). Enter to complete. The name is applied to all selected layers. Repeat for other groups within the same map, assigning a different name. Note that grouped layers do not need to be from adjacent layers in a mapper. Just select the layers using ctrl-click if they are not adjacent. Collapse a group by double clicking on the first layer in a named set. When you select a grouped layer, the corresponding navigation nodes select. Change a grouped attribute and all grouped layers are adjusted. This includes style settings, so ensure that this is really what you want to do first! Session > Remove Saved Map Group Details deletes all the accumulated map groups on your system. When layers and tables are shown, icons indicate the layer type and contents. A catalog summary of table characteristics is a cornerstone for LayMan operations. Their simplest function is to provide quick user feedback as to table contents. Contiguous, semi-transparent region layer ..
Icons alongside the layername indicate if the layer has unsaved edits and if it is a query table. Right click a layer or table icon to see a context menu of available functions. Apply the selected filter changes to the catalog view. Show the catalog by table name or path. This is a quick view change. Remove duplicates removes consecutive references in by name view if the name and row count are the same. Show only tables intersecting.. removes tables from the list if their MBR does not intersect the front mapper MBR. Click on another mapper and click Apply Filter to quickly see the tables that would contribute to that map. Show base .. WMS tables removes tables from the list that are not shown checked. Show selected table.. loads the table for view and edit. 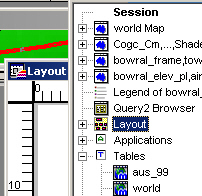 Show..bounds shows the selected table bounds and name on the front mapper. A display layer is created and inserted into the map. 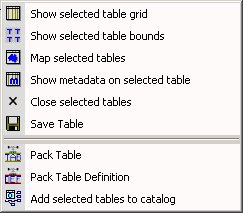 Pack Table Definition compacts string fields to the maximum length required to hold all data. Checked and runs with an error. Build catalog from network and run each workspace in safe mode to check validity. Safe mode can be run on all catalog entries without user interaction to check for errors. Icons give a clear indication of the status of each statement as it runs. Provides for auto or manual correction of problems. Step execute a workspace, repairing broken table references . Uses RemoteMsgHandler to interrupt, pause, message or end an application. Sample MBX and MB provided. A customisable, well organised and fast symbol picker for existing map symbol objects.Catalog builds from standard MI fonts. Edit class table and add your own fonts. Click on mapper point object and click catalog symbol to change. Navigation window provides a 2-level tree view of windows, layers and tables. List is updated dynamically as MapInfo windows gain focus, open and close. Click to set focus. Double click to activate the table, mapper or layout in the edit grid on the right. Table grid edits include data checking with warning messages. The object column is exposed allowing object properties to be changed with the other attributes. The initial display of table grid data is formatted such that column widths adjust to the largest data item. Right click a polyline or region row in the table grid and click Load Selected Object Details. An object grid for the selected object replaces the table grid and nodes display on the map object. Select some rows (nodes) from the grid. The selected nodes are also highlighted in the map. Alter one of the selected node coordinates and see the changes in the grid and map object. Coordinates are the only editable columns in the object grid. Use reshape in the normal manner in MI Pro. and refresh in LM to update the object grid. Layout grid provides layout object properties for select and editing. Easy to find and select small or hidden frames and objects. Click the object type cell to quickly adjust properties.